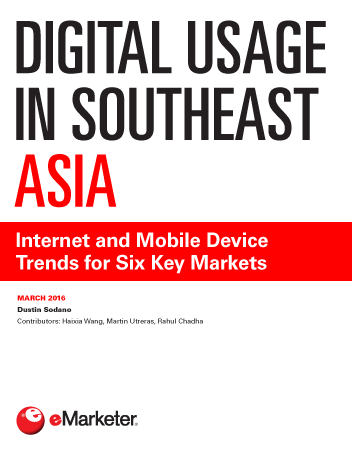 This report provides an overview of key digital usage trends in six markets in Southeast Asia: Indonesia, Malaysia, Philippines, Singapore, Thailand and Vietnam. Only 36.5% of the population in Indonesia will be internet users in 2016, the second-lowest level among the countries in Asia-Pacific tracked by eMarketer. Nevertheless, internet user penetration in that country is growing rapidly. Internet use still falls short of a majority in Malaysia. eMarketer estimates the country will be home to 15.2 million internet users in 2016, representing 49.2% of the total population. 2016 will be the first year in which a majority of the Philippines’ population are internet users. The number of internet users will climb another 10.1% in 2016. Singapore will have 4.4 million internet users in 2016, representing 76% of the overall population. Internet penetration is projected to edge even higher over the next few years. Far less than half of Thailand’s 68 million residents will be internet users in 2016. While the country’s internet penetration will grow over the next few years, eMarketer predicts it will remain below 50% through 2019. 2016 will be the first year more than half of Vietnam’s residents access the internet at least once per month. "Internet penetration rates in six key markets in Southeast Asia will range from just under 40% in Indonesia to more than 75% in Singapore in 2016, eMarketer predicts. But those rankings reverse when looked at by numbers of users, thanks to the respective population sizes involved."